Inicio » Noticias Goldcar » We have the winners of the trip to New York and other great Goldcar prizes!! We have the winners of the trip to New York and other great Goldcar prizes!! We already have the names of the winners of the amazing trip to New York, as well as the various prizes from Goldcar to thank our customers for their trust. Do you want to know who the lucky ones, that will enjoy these prizes, are? Congratulations to David López Roca, winner of a wonderful trip to New York, flight tickets and 4* hotel included. The “Big Apple” is waiting for you!! Who wouldn’t enjoy as a child with shows and attractions at any theme park? Ivana Dimitrijevic will experience a weekend at an amusement park for 2 with flight tickets and 4* hotel included. Thomas Baldner, Joseba Ramos Rodríguez, Weronika Winkowska, Rosa Cuadrado and David Venegas Gallardo will be awarded with an cycling kit from GOLDCAR BIKE SPORT. Likewise, Nikolaos Stefanis, Bernard Thomas Howfield, Patricia Badier Cossas, Pablo José Bujosa, Silvia Bertolissi, Ángeles Negrín Serrano, Dirk Zimmermann, Javier Alarcón, Vianne Van Wees and Javier Torres Bori are the winners of a free electric car rental. And finally, Carl Blumer will enjoy the experience of driving Super Sports Car for 24 hours. We would like to thank you all for believing in Goldcar during 2015 and we would also like to remind you that we will have a lot more surprises on 2016 , so don’t forget to check out! 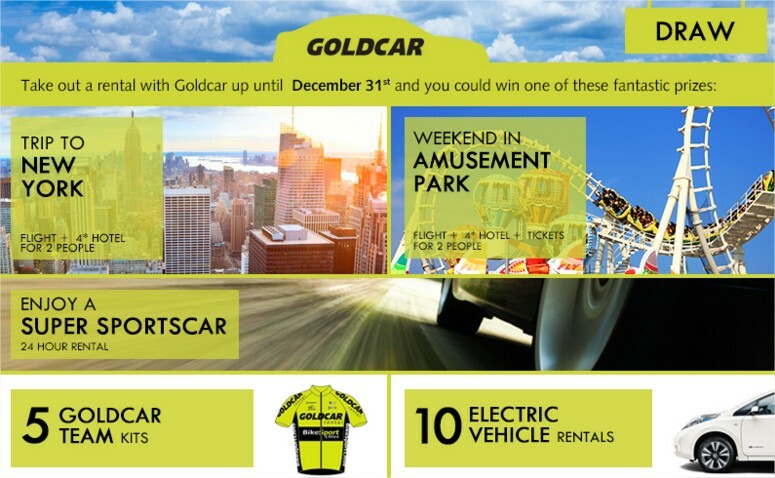 ** Winners have been chosen among all the people that rented a Goldcar between October 1st and December 31st 2015. We have the winners of the trip to New York and others Goldcar draws among all the people that rented a Goldcar between October & December 2015.